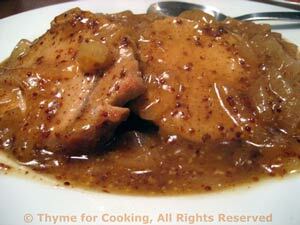 Thyme for Cooking Dinner tonight: Honey Mustard Pork. Braising pork chops keeps them moist and tender; honey and mustard are another classic pairing. Together, it makes a simple, sweet-savory mid-week dinner. 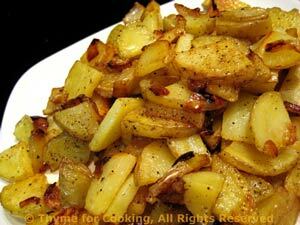 Fry a few potatoes and onions, and steam the last of the broccoli to round out this easy dinner. A bit of garlic and butter can really bring out the flavor of broccoli and raise it from the mundane to the fantastic! Put in steamer basket in saucepan with an inch of water in bottom. Put on medium heat and steam for 12 - 15 minutes or just until done, careful not to overcook. Sauté briefly, then add broccoli. Toss well to coat. 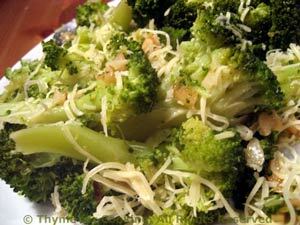 Put broccoli into the serving dish, sprinkle with cheese and serve.